This guide will walk you through the steps to create a two-node shared disk cluster for SQL Server on Red Hat Enterprise Linux 7.2. 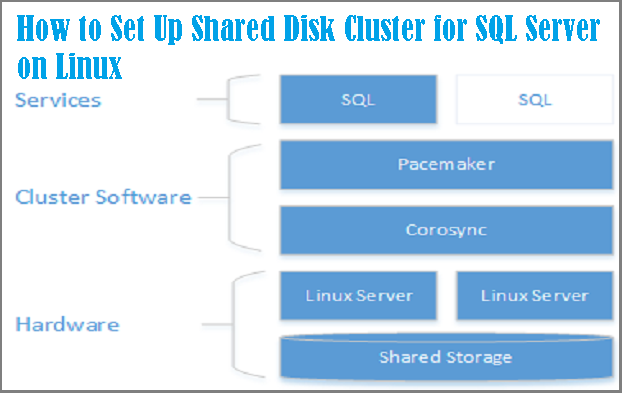 The clustering layer is based on Red Hat Enterprise Linux (RHEL) HA add-on built on top of Pacemaker. The SQL Server instance is active on either one node or the other. Access to Red Hat documentation requires a subscription. As the diagram below shows storage is presented to two servers. Clustering components - Corosync and Pacemaker - coordinate communications and resource management. One of the servers has the active connection to the storage resources and the SQL Server. When Pacemaker detects a failure the clustering components manage moving the resources to the other node. For more details on cluster configuration, resource agents options, and management, visit RHEL reference documentation. This is not a production setup. This guide creates an architecture that is for high-level functional testing. The following sections walk through the steps to set up a failover cluster solution. The first step is to configure the operating system on the cluster nodes. For this walk through, use RHEL 7.2 with a valid subscription for the HA add-on. Install and setup SQL Server on both nodes. For detailed instructions see Install SQL Server on Linux. Designate one node as primary and the other as secondary, for purposes of configuration. Use these terms for the following this guide. On the secondary node, stop and disable SQL Server. On the primary node, create a SQL server login for Pacemaker and grant the login permission to run sp_server_diagnostics. Pacemaker will use this account to verify which node is running SQL Server. On the primary node, stop and disable SQL Server. Configure the hosts file for each cluster node. The host file must include the IP address and name of every cluster node. Check the IP address for each node. The following script shows the IP address of your current node. Set the computer name on each node. Give each node a unique name that is 15 characters or less. Set the computer name by adding it to /etc/hosts. The following script lets you edit/etc/hosts with vi. The following example shows /etc/hosts with additions for two nodes named sqlfcivm1and sqlfcivm2. In the next section you will configure shared storage and move your database files to that storage. There are a variety of solutions for providing shared storage. This walk-through demonstrates configuring shared storage with NFS. Open the firewall the server. Do the following steps on all cluster nodes. On the primary node only, save the database files to a temporary location. On all cluster nodes edit /etc/fstab file to include the mount command. The following script shows an example of the edit. Run mount -a command for the system to update the mounted paths. Copy the database and log files that you saved to /var/opt/mssql/tmp to the newly mounted share /var/opt/mssql/data. This only needs to be done on the primary node. Validate that SQL Server starts successfully with the new file path. Do this on each node. At this point only one node should run SQL Server at a time. They cannot both run at the same time because they will both try to access the data files simultaneously. The following commands start SQL Server, check the status, and then stop SQL Server. At this point both instances of SQL Server are configured to run with the database files on the shared storage. The next step is to configure SQL Server for Pacemaker. Install Pacemaker packages on each node. Set the password for for the default user that is created when installing Pacemaker and Corosync packages. Use the same password for on both nodes. Enable and start pcsd service and Pacemaker. This will allow nodes to rejoin the cluster after the reboot. Run the following command on both nodes. Install the FCI resource agent for SQL Server. Run the following commands on both nodes. One one of the nodes, create the cluster. The following command disables the fencing agents. SQL Server Resource Name: A name for the clustered SQL Server resource. Timeout Value: The timeout value is the amount of time that the cluster waits while a a resource is brought online. For SQL Server, this is the time that you expect SQL Server to take to bring the master database online. Floating IP Resource Name: A name for the IP address. IP Address: THe IP address that clients will use to connect to the clustered instance of SQL Server. Update the values from the script below for your environment. Run on one node to configure and start the clustered service. For example, the following script creates a SQL Server clustered resource named mssqlha, and a floating IP resources with IP address 10.0.0.99. It also starts the failover cluster instance on one node of the cluster. After the configuration is pushed, SQL Server will start on one node. Verify that SQL Server is started. The following examples shows the results when Pacemaker has successfully started a clustered instance of SQL Server. This part of the article describes how to do the following tasks for SQL Server on a shared disk failover cluster with Red Hat Enterprise Linux 7.2. The resource move command creates a constraint forcing the resource to start on the target node. After executing the move command, executing resource clear will remove the constraint so it is possible to move the resource again or have the resource automatically fail over. The following example moves the mssqlha resource to a node named sqlfcivm2, and then removes the constraint so that the resource can move to a different node later. The new node needs a unique name that is 15 characters or less. By default in Red Hat Linux the computer name is localhost.localdomain. This default name may not be unique and is too long. Set the computer name the new node. Set the computer name by adding it to /etc/hosts. The following script lets you edit /etc/hosts with vi. The following example shows /etc/hosts with additions for three nodes named sqlfcivm1, sqlfcivm2, andsqlfcivm3. The file should be the same on every node. Stop the SQL Server service on the new node. Run mount -a for the changes to take effect. Install Pacemaker packages on the new node. Set the password for for the default user that is created when installing Pacemaker and Corosync packages. Use the same password as the existing nodes. Enable and start pcsd service and Pacemaker. This will allow the new node to rejoin the cluster after the reboot. Run the following command on the new node. Install the FCI resource agent for SQL Server. Run the following commands on the new node. The following example ads a node named vm3 to the cluster. In troubleshooting the cluster it may help to understand how the three daemons work together to manage cluster resources. Corosync Provides quorum membership and messaging between cluster nodes. 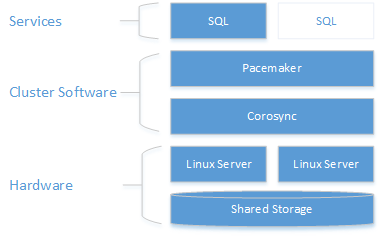 Pacemaker Resides on top of Corosync and provides state machines for resources. PCSD must be running in order to use pcs tools. sudo pcs status returns basic information about the cluster, quorum, nodes, resources, and daemon status for each node. In the example, partition with quorum means that a majority quorum of nodes is online. If the cluster loses a majority quorum of nodes , pcs status will return partition WITHOUT quorum and all resources will be stopped. online: [sqlvmnode1 sqlvmnode2 sqlvmnode3] returns the name of all nodes currently participating in the cluster. If any nodes are not participating, pcs status returns OFFLINE: . PCSD Status shows the cluster status for each node. Check the following items when a node is offline.